Finding an inviting home can be hard work, but you can easily entice nesting birds to your yard year after year. This handcrafted bird nesting box can be mounted on a wall or hung freely, so you can observe your feathered friends from anywhere in your yard. The manufacturer recommends a quiet location 5 to 10 feet from the ground or higher. Birds enter this natural-looking safe haven through the small round opening in the front. For cleaning, simply turn the small gold knob on the front of the nesting box and slide the door. 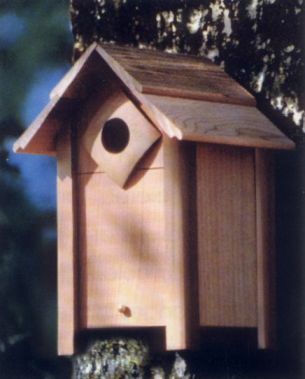 This unfinished cedar nesting box is not as sleek and decorative as some, but cheery chickadees, wrens, and nuthatches will appreciate your gesture of hospitality. Dimensions: Height 11 in., Interior width: 4 in. x 4 in., Height to hole: 4 1/2 in., Hole size: 1 1/4 in.